In my travels around Ireland I have found you can often find the most incredible places, relics, statues etc in the most unlikely of settings. St Manchan’s church at Boher, Ballycumber, Co Offaly is a great example. From the outside the church looks like any other nineteenth century parish church found around Ireland. There isn’t anything very out of the ordinary about the building which was constructed around 1860’s. It has a cruciform plan and is a functioning parish church, used every day by the local community. If you take the time to go inside the church you will find a collection of magnificent stained glass windows by the internationally renowned stain glass artist Harry Clarke (1889-1931), as well as St Manchan’s shrine one of the finest surviving examples of medieval Irish reliquaries. It is though St Manchan’s shrine was originally constructed to house the bones of St Manchan the founder of the nearby monastery of Lemanaghan. 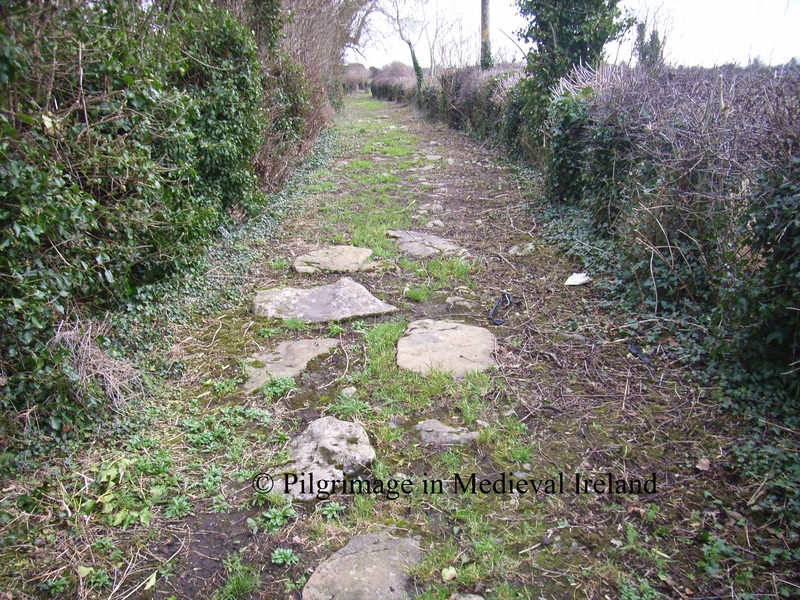 I have previously written about the history of the monastic site of Lemanaghan. This reference likely refers to the Lemanaghan shrine although it is possible it may refer to second shrine now lost, that existed at Mohill. Fragments of bone possibly from the saint are still found within the shrine. From the sparse references that exist the shrine appears to have been housed near the high altar of St Manchan’s church at Lemanaghan where it remained until the seventeenth century. It was later moved to a chapel in Boher and following the building of the parish church the shrine was moved to its current location where it remains, absent only for a brief period following a theft in 2012. St Manchan’s shrine is what is known as a house- shaped shrine and resembles the pitched roof of church or oratory and it is decorated with intricate bronze work, gilt and enamel. The shrine is made of yew wood (48cm tall by 40 cm wide by 61cm long) and is covered with highly decorated bronze figures and bosses sitting on four feet. The bosses and decorated panels are arranged in a cruciform design on the front and back of the shrine. The sides or gables of the shrine are covered in elaborate filigree and enamel work. There were originally 52 figures bronze figures attached to the shrine by small bronze nails. If you look carefully you can still see the holes. The figures filled the spaces created by the cross motif on the front and back of the shrine. Only eleven figures are still attached and it has been suggested the figures may represent monks or abbots of the monastery. Bronze figures attached to St Manchan’s shrine. The shrine was designed to be portable and could be carried in processions. Four metal loops are found at each corner which allowed wooden poles to be treaded through. A reliquary procession may have formed part for the pilgrim rituals at Lemanaghan on the more important days in the pilgrim calendar such as the saints feast day. It is likely that the date of the translation of the saint’s relics would also have been a special day in the pilgrim calendar. For a detailed discussion of the shrine I recommend checking out the book Sacral Geographies by Karen Overbey. If you follow my facebook page Pilgrimage in Medieval Ireland you will know I am a big fan of Harry Clarke’s work. Boher church has five wonderful Harry Clarke windows. The windows were commissioned from the Harry Clarke studio, in 1930 at a cost of £330. My favourite window depicts St Manchan the patron saint of the parish. It is clear that Clarke took inspiration from local folklore relating to the saint and from St Manchan’s shrine. Harry Clarke window depicting St Manchan in the south transept. 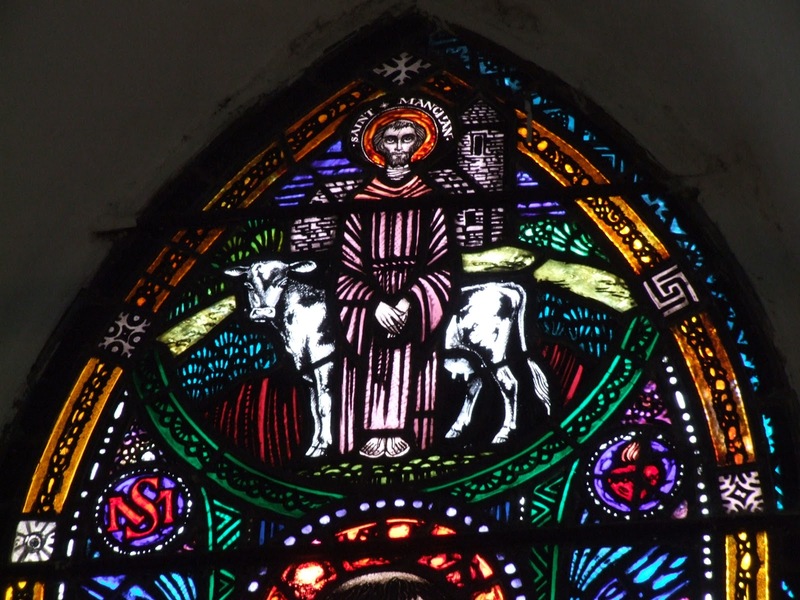 The window depicts Manchan holding a green book above the saints head is an image of the saint with his cow. I have written previously about St Manchan and his cow who was famed for her ability to produce an endless supply of milk. 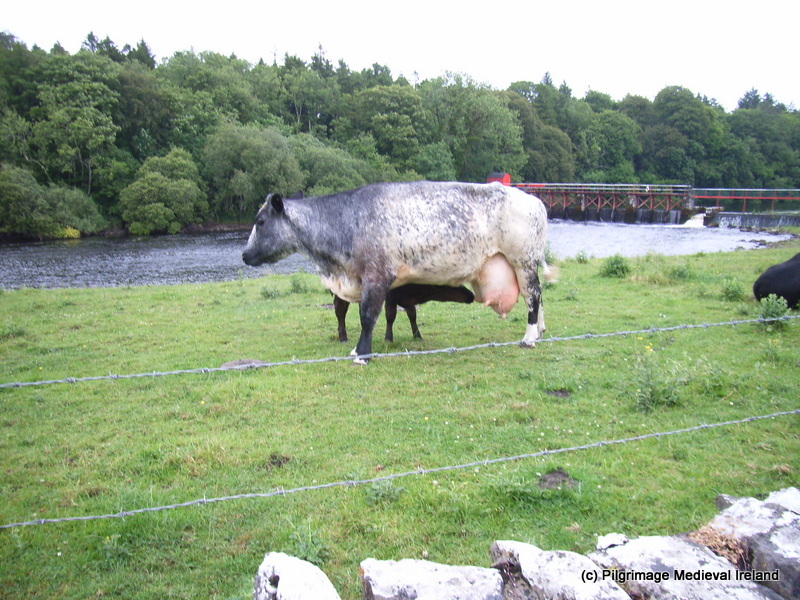 The cow features strongly in local folklore. It also includes a life-sized image of the shrine, aglow with gold and bronze. When you view the actual object first and then its likeness in jewelled stained glass behind, the genius of Clarke’s commissioned work is profoundly evident. It was made for this place, to complement the shrine, and its south-facing aspect means both the window and the gilt-bronze shrine glow a luminous amber for hours. Behind the altar are three stunning windows of the Blessed Virgin, Christ and St Joseph all depicted in rich vibrant of colours. All the figures have angels over head. St Joseph who was a carpenter is depicted holding a set square in his hand while the Christ figure has the holes in his feet and hand from his crucifixion. The details of the images such as the use of colour, the fine details of the folds in robes, patterns on fabric are amazing. The fifth Harry Clarke window is located in the north transept and depicts St Anne with the Blessed Virgin as a child. It’s amazing to think this little church in rural Ireland houses such treasures. If you are visiting Offaly I highly recommend a visit to Boher church. It is the most inspiring and most wonderful place to spend time. Harbison, P. 1991. Pilgrimage in Ireland. The Monuments and the People. Syracruse University Press. O’Brien C. 2006. Stories from a Sacred Landscape Croghan Hill to Clonmacnoise. Mercier Press.